In this volume an international assembly of experts historians, sociologists, demographers and politicians join forces in order to assess the nature and magnitude of the impact created by this emigration and to examine the fate of those Jews who left and those who remained. Their wide-ranging perspectives contribute to creating a variegated and complex picture of the recent Russian Jewish Emigration. "The essays and research studies in this collection identify the complex processes involved in recent Russian Jewish immigration to Israel and the United States, and they succeed where most immigration studies have been limited ... 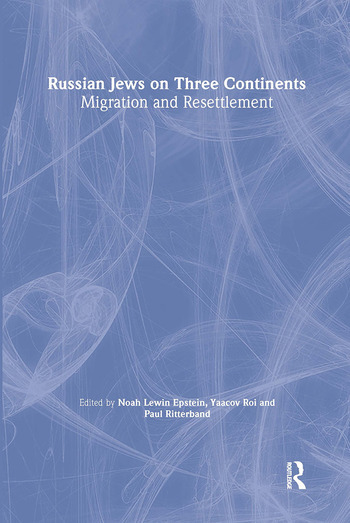 It is a remarkable collection, given the newness and complexities of this immigration, the continuing immigration from Russia, and the absence of time to assess the integration of the second generation ... the volume contributes significantly to our understanding of the range of issues associated with Russian immigration and is a firm basis for further research on Russian Jewish immigration as it unfolds." "The vast array of subjects, the erudition of the participants, and the depth of their knowledge, lend much credence to this book." Studies in Contemporary Jewry- " Russian Jews on Three Continents provides a wealth of information, especially on the economic and cultural aspects of the absorption of Soviet Jews...Viewed as a kind of encyclopedia, this compendium offers very useful background information and analyses in a number of areas, particularly those concerning absorption.